Geology is often viewed as the study of the past, of what happened to get the planet to this point. But many geologists are equally interested in the future, using information collected on climatic, tectonic, and biological change to figure out where the planet is headed. 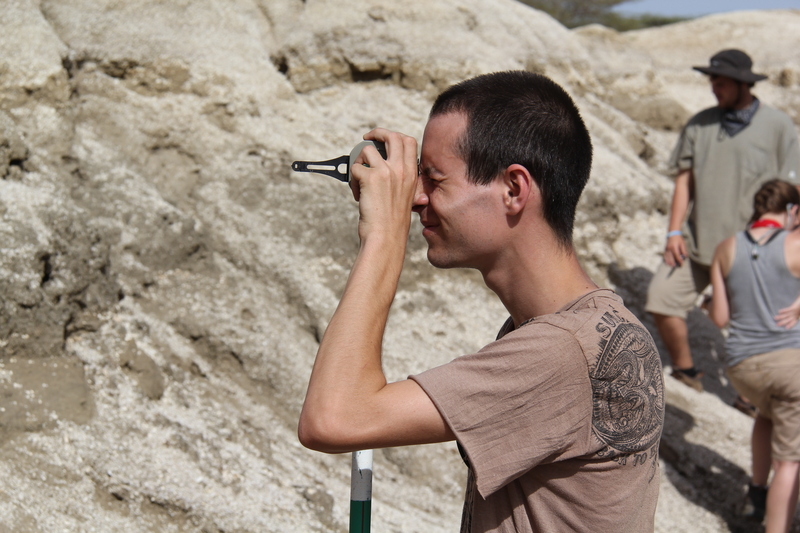 Dr. Bob Raynolds, research associate Denver Museum of Nature and Science and professor at the Colorado School of Mines and a self-proclaimed alumnus of the Turkana Basin Field School since he cut his geological teeth as an undergraduate in the Basin, visited TBI during a swing through East Africa. He delivered a lecture on the implications of the “Anthropocene” the newest geological slice of time to be added to the timescale. 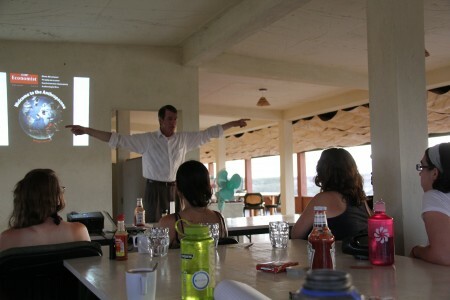 Dr. Bob Raynolds teaches the Spring 2013 Field School about the Anthropocene. The Cenozoic, the name for the current “Age of Mammals” is divided into seven “-cenes” starting with the Paleocene 65 million years ago after the dinosaurs go extinct and ending with the Holocene, the time since the last glaciers that capped the Northern Hemisphere all the way down to New York in North America retreated back to the Arctic. Dr. Raynolds used the new name as a launching point for discussing the dramatic changes that have taken place in the last century as climate has spiked, carbon piles up in the atmosphere, a mass-extinction sweeps through the biosphere, the population booms, and we come to a fuller realization that our choices affect the planet in tangible ways. The kicker is the planet is also changing on its own as glaciers roll across the landscape and seas rise and fall. Couple “natural” change with human-induced change, and it becomes really tough to figure out where the volatile planet will take us. Lecturing in the mess hall at TBI, Dr. Raynolds asks if we will survive the Anthropocene. Baily, Eve, Rosie, and Ashley consider the question. 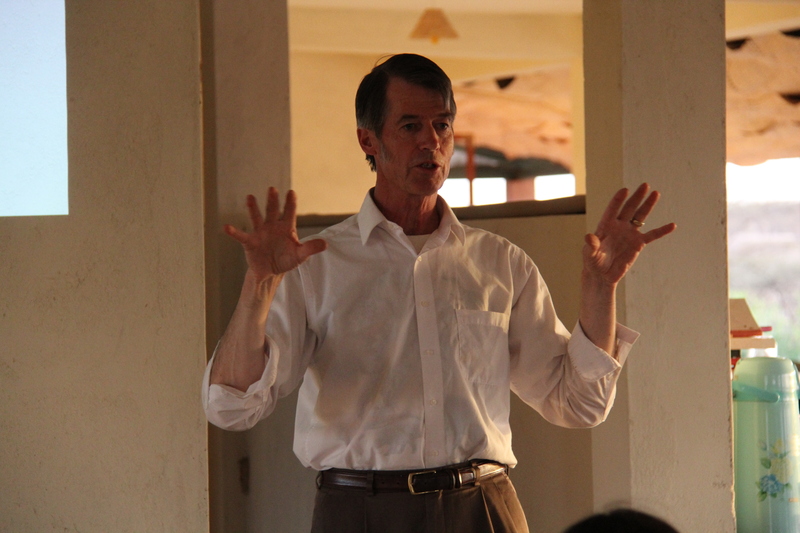 Dr. Raynolds has been working in the Turkana Basin since the 1970s and has seen the dramatic changes that have affected the delicate ecosystem as the grasslands recede and deserts expand. But he didn’t leave his listeners with an entirely bleak picture of the future of the planet. He pointed to important new technologies such as the Internet as incredibly powerful tools for sharing and combining data to dissect complex problems. Through invention and collaboration, we can get the planet back on track. He left us with a simple image. For centuries, the human dinner table has groaned with plenty. Now the waiter has shown up with the bill. The people who started the feast left a while ago. The people at the table need to figure out how to pay. Based on my experiences, the bill eventually is paid. There’s a lot of whining about the people who left without closing their tab and how to equitably split things up. But the bill gets paid. 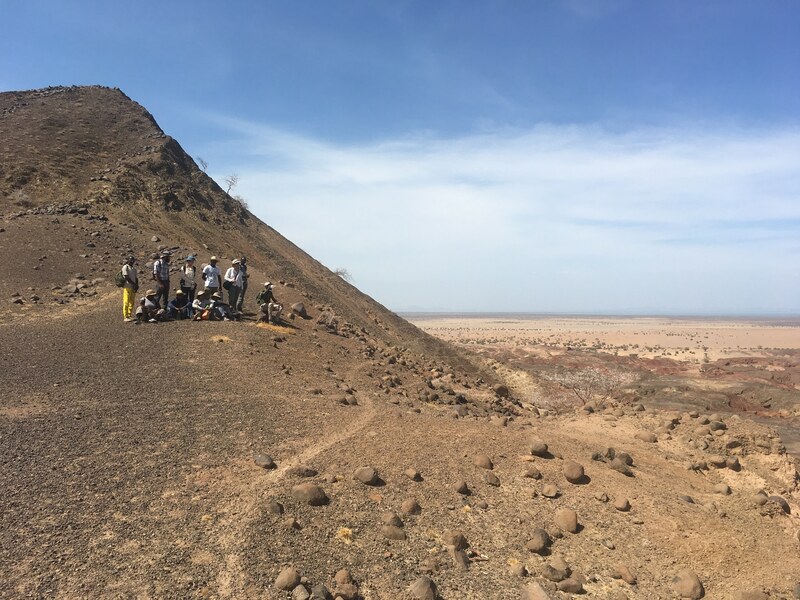 The day after Dr. Raynold’s lecture, Dr. Feibel lead the field school to Epim, a locality close to camp that records the high-stand of Lake Turkana nine-thousand years ago. Epim perfectly illustrates the transitive nature of the environment that humans tend to assume is a constant. Francis and Rob poised on the top of a Holocene butte, ready to sort out the rivers and lake shores that made the rocks under their feet. 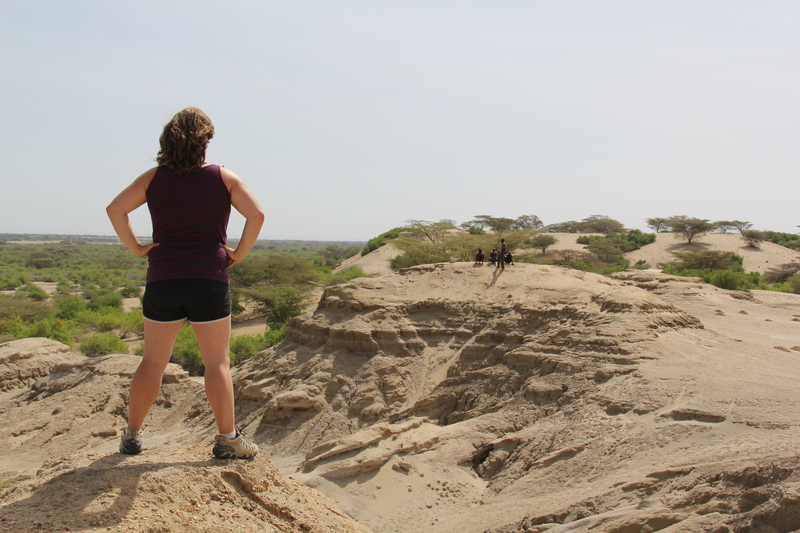 In the grand geological scheme, Lake Turkana is a pretty recent phenomenon. For most of the last four-million years, the Turkana Basin has been dominated by the Omo River, the main artery feeding Lake Turkana today. The proto-Omo looped through the basin, its water flowing east towards the Indian Ocean. The river carried sediment along with water and laid down sandstone and mudstone that preserves the biological history of the region. Periodically, rifting would drop the bottom of the Turkana Basin, and water would fill the void. The river would quickly bring in sand and silt and the lake would once again transform into a wandering river like the Congo, Mississippi, or Amazon. Leanna, Natalie, and Rachel use the survey techniques honed during the first week of the geology module to sort out their mudstones, course sands, and fine silts. Through the geology module, the students are constantly been reminded by the rocks we walk over that what we see today is not what would have been found in the Turkana Basin in the past, even the recent past when the earliest civilizations were busy inventing writing and monumental architecture. 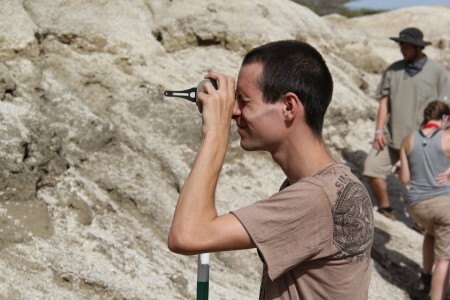 Aaron uses his Brunton geological and survey compass to make sure he's keeping his stratigraphic column on the level. Ana sketches a profile of the outcrop, trying to capture the major features preserved in the rock. Aaron, Tim, and Ashley take a closer look to make sure all the details are recorded on maps and profiles. 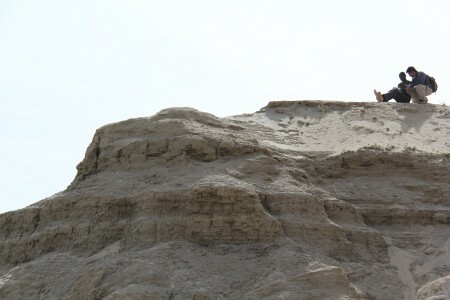 At Epim, the task was to climb the seven-thousand-year-old cliffs and chart the changing environment with each new batch of sediment. Over a few thousand years, the beach moved in and out, indicating the expansion and contraction of the massive waterway. 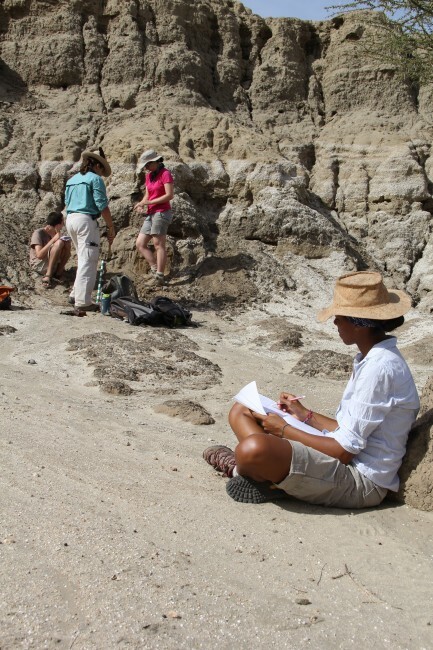 This is recorded by drawing geological columns and section profiles of the exposed rock. 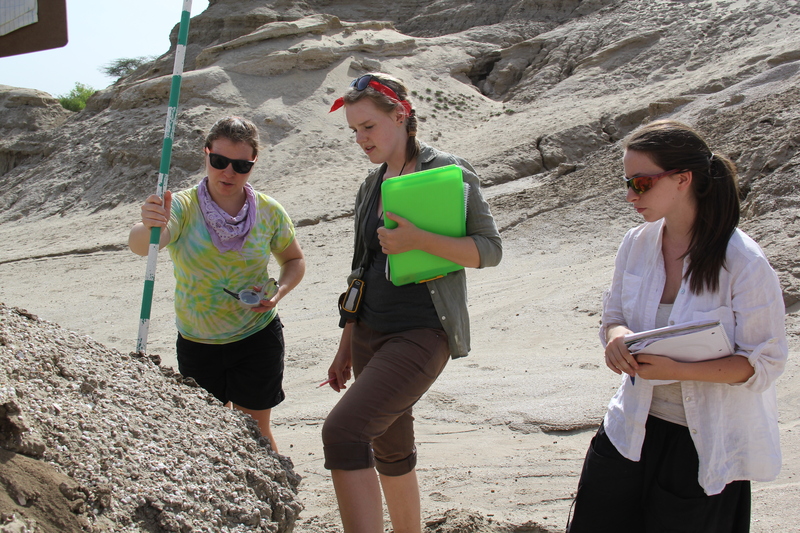 As the groups scrambled over the loose scree, they uncovered evidence of the ancient residents of the beaches and rivers. 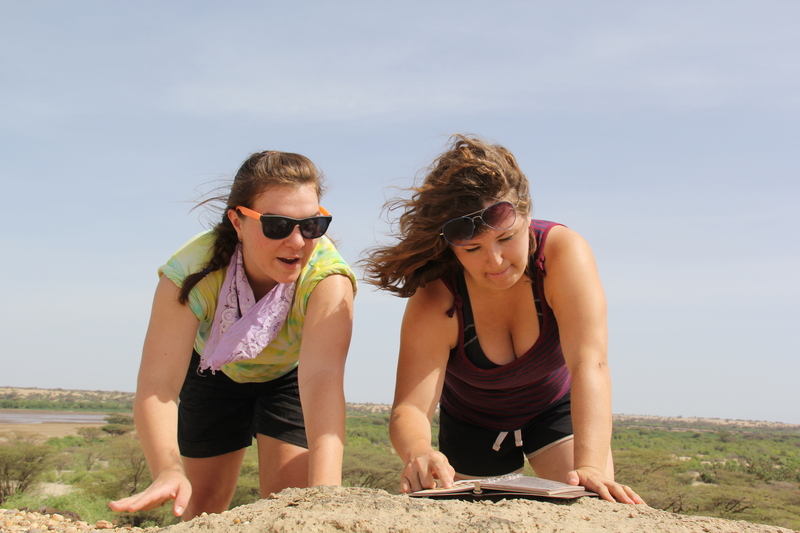 Leanna and Rosie discuss the correct color classification of the rocks that cap the section and provide the perfect perch for examining the distant rivers and lakes. This is not an environmentally stable planet and it’s difficult to figure out what the consequences of natural phenomena such as a dropping Lake Turkana will be. Add our own influences, such as a massive dam on the Omo River in southern Ethiopia that will cut off 80% of the water flowing into Turkana and will drop the 30 meter-deep lake by several meters per year and it becomes clear that we still lack the capacity to understand the implications of the Anthropocene. Bailey, Maegan, Eve, Holly, and John get close to the top of the section, but take a precariously perched moment to make sure they agree they're seeing the same structures in the rock. 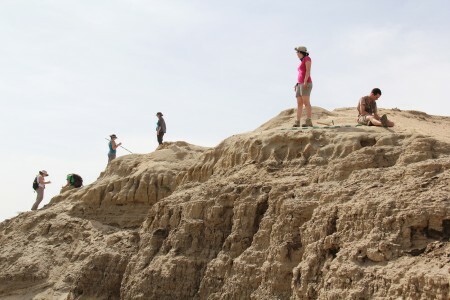 At the Holocene site, the transitions in the lake were recorded in the piled sand and mud, and in the shells and bones of river and lake animals. Tiny snails and clams were as plentiful in some layers as the sand. Massive fish vertebrae belied the expansive habitat and next level of the food chain. 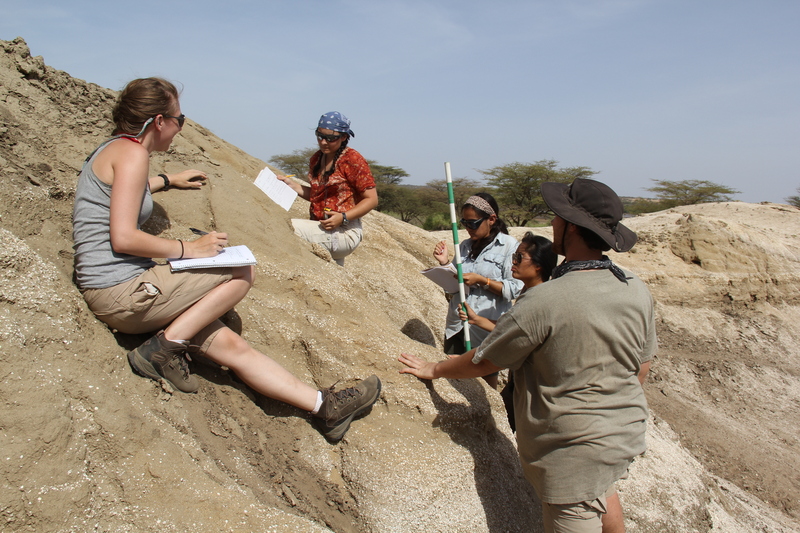 Turtle shells and crocodile scales topped off the fauna and completed the lush image of the recent history of Lake Turkana. Far in the distance we could see the lake, an apparently stable constant for the people and animals that call the basin home. But, if we learn to read the story preserved in layers of sediment, the dynamic history of the entire basin comes to life…and goes extinct. John exhibits one of the large fish spines characteristic of many freshwater deposits around the Tukana Basin. They may be common, but finding any fossil should trigger a grin. 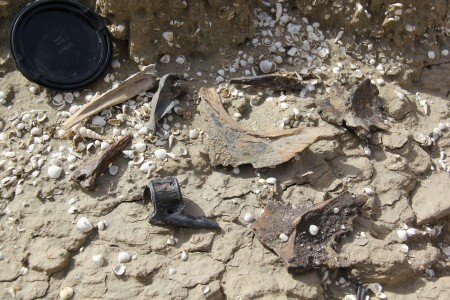 Bones recovered from Epim including fish spines, snail shells, clam shells, fish vertebrae, fish skull fragments, crocodile scutes, and turtle shell fragments. These are none-too-subtle clues that we were walking across a formerly thriving freshwater ecosystem. 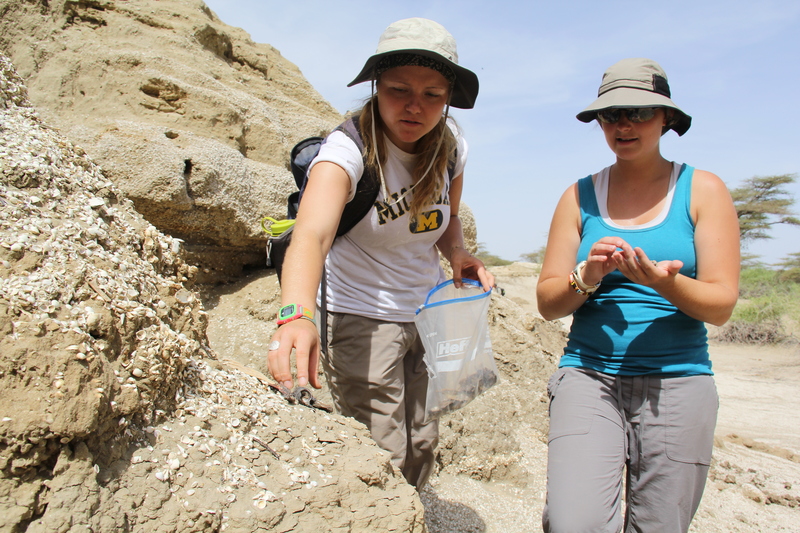 Ingrid reaches for a fragment of a fish vertebra she found while measuring the cliffs of Epim. 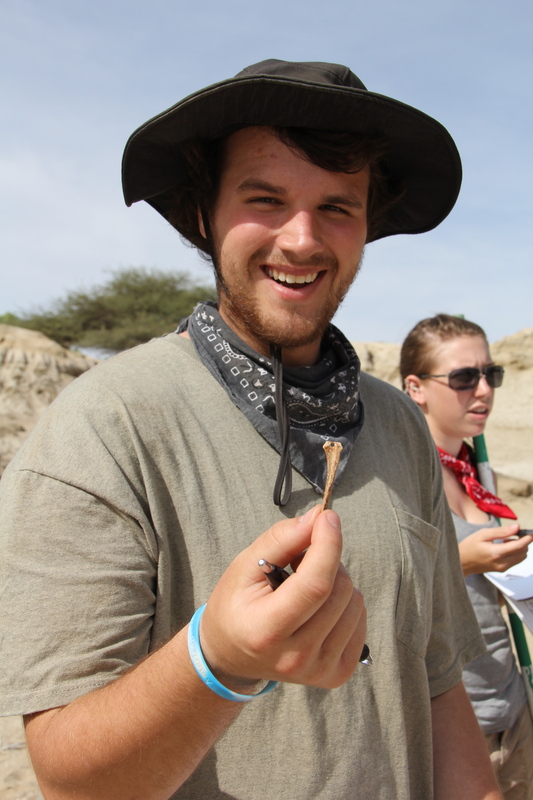 Sam tries to figure out if she's holding a fragment of turtle or a croc. If there is anyone around to excavate the early record of the Anthropocene, what changes will they see? Will they see us trying to balance the carbon budget of the planet and attempting to rationally manage our hydraulic resources? Or will they see an intelligent species flailing around, searching for who to blame when someone just needs to belly up and pay the bill? Rosie surveys the rock she surveyed. This is the confidence that will help us survive the Anthropocene.